Just as the Sun can help us to find our general bearings during the day, so can the Moon at night. Moonrise and Moonset. As in the case of the Sun, the Moon will rise between north east and south east and will set between north west and south west. The exact bearing will depend on the observer’s latitude, and the Moon’s declination but in a survival situation, this is not important; all we need to know is that the Moon will rise in the east and set in the west. Moon Tips. 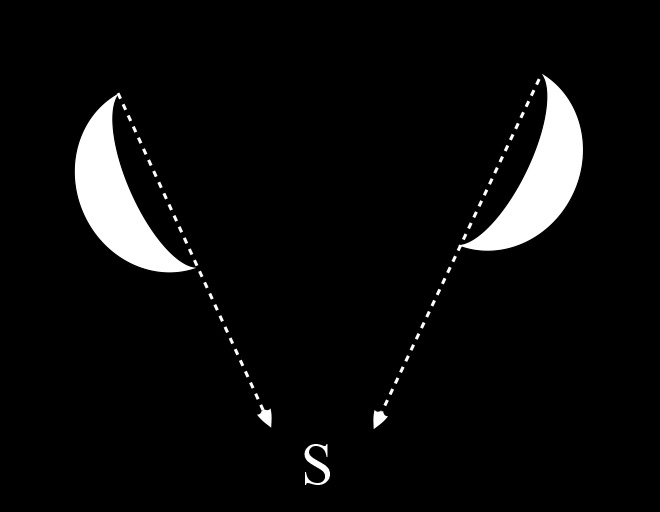 A crescent moon can provide us with a quick and easy method of finding the directions of north and south. If you imagine a line that joins the tips of the crescent and extend this line down to the horizon, it will point roughly south for observers in the northern hemisphere. In the southern hemisphere, the line will point to the north. Shadow Stick. Sometimes, the Moon will be bright enough to cast a shadow and when this happens, we can use the same shadow stick method that we use for the Sun to find the directions of east and west. Waxing / Waning Moon. If we are out in the open in a survival situation, we will have plenty of opportunity to study the night sky and so we will probably know if the moon is waxing or waning and this knowledge can help us to find the directions of east and west. When the Moon is waxing (between the new moon and the full moon) it follows the Sun as it crosses the sky from east to west and so, as we look at it from the Earth, its western side will be illuminated. When the Moon is waning (between the full moon and the new moon) it leads the Sun across the sky and so its eastern side will be illuminated. Face the direction in which you plan to travel and point in the direction of the Moon. Hold this position for a few seconds until the Moon’s direction relative to your body is imprinted in your mind. Set off on your chosen course keeping the Moon in the same relative position. Stop every ten to fifteen minutes to reacquaint yourself with the Moon’s relative position.